In his most recent article for The Detail, Londonderry/Derry based commentator Paul Gosling looks at Northern Ireland's trade with Great Britain and the Republic of Ireland in light of the EU Summit in Salzburg. Theresa May’s rebuff at the Salzburg EU summit has narrowed her options if she is to secure a Brexit deal. The UK seems to be heading for a choice between a Norway-style deal – with continued membership of the single market financial contributions and taking EU rules - all unacceptable to the Conservative Party; or a Canada-style deal, involving a controlled border with Ireland. A third option exists: for Northern Ireland to have special status with controls on goods shipped between Great Britain and Northern Ireland. But this has been ruled out by the DUP. In which case, in terms of the future of trade, it becomes a choice between east-west or north-south. There is a tendency among some politicians to argue that Northern Ireland’s trade with Great Britain is much more important than its trade with the Republic of Ireland. This is misleading. Northern Ireland’s trade with both GB and the Republic are vital – losing either as a result of Brexit would be very damaging. DUP deputy leader Nigel Dodds recently spoke of the “catastrophic damage that would be done to Northern Ireland if we were to be separated economically from our main market in the rest of the United Kingdom”. In truth, while losing east-west trade would be a disaster for one set of businesses (including many of NI’s largest), losing north-south trade would be terrible for even more of NI’s businesses. About 50% more businesses in Northern Ireland export to the Republic than sell to GB. Many of these companies and their transactions are small as previously highlighted by The Detail in the graphic above. When Boris Johnson recently said: “There are only about 50 large companies that trade across the frontier [in Ireland]” this was another misleading claim. For one thing there are about 100 large companies that do so and secondly most of the cross-border business is conducted by SMEs. Businesses in Northern Ireland sold £15billion of goods and services to Great Britain in 2016. This is significantly more than the £4bn sold from NI into the Republic of Ireland. But that £4bn represents a large proportion of NI’s international exports – it is more than the £3bn of goods and services sold to the whole of the rest of the European Union and almost as much as the £5bn of exports to the world outside the EU. More than half of Northern Ireland’s international exports of goods went to just two markets: the Republic is the largest, followed by the United States. While the Republic was the largest export destination for food and live animals, the United States was the largest for machinery and transport. Northern Ireland has a trading surplus with the Republic, as does the UK as a whole. Ireland was one of just four EU states the UK had a trade surplus with in 2017 – the other three were with Luxembourg, Sweden and Denmark. And Northern Ireland is the UK’s most important region in terms of trade with the Republic. Northern Ireland accounted for 14% of all UK goods exported to Ireland and 14% of all UK goods imported from Ireland. 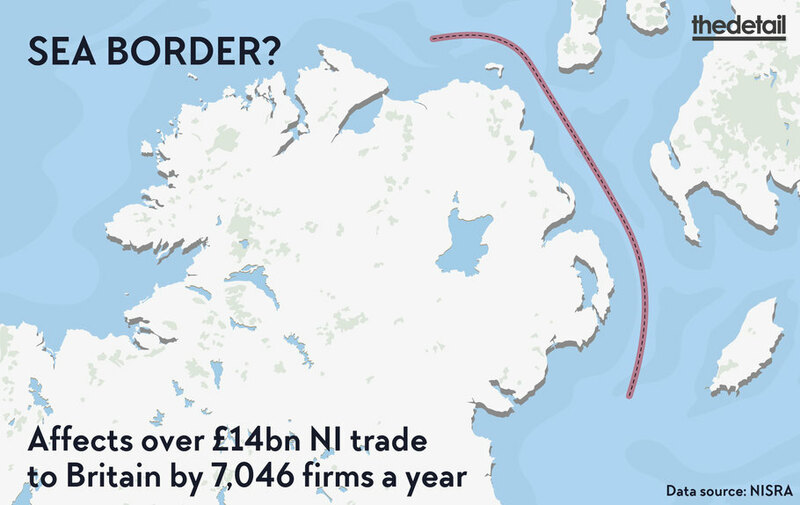 Trade within Northern Ireland is larger, involving around £50bn of annual activity. But much of this trade – particularly in food –involves cross-border production. 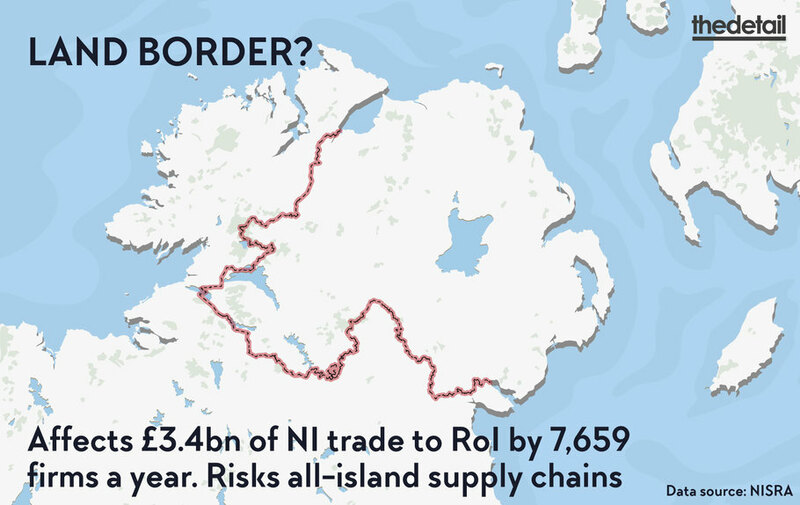 According to a UK government paper last year, cross-border supply chains “are vital to Northern Ireland’s economy” including for sales to Great Britain. And 15% of NI businesses exporting to the Republic do so with goods which involved cross-border processing. This is the context for recent remarks from the head of the Northern Ireland Civil Service, David Sterling. He explained that “we have deep concerns about the risk that no deal is agreed and there is a chaotic exit from the EU.... Our research has shown that two-thirds of cross-border trade involves supply chain activity. How would this work if they had to make Customs and VAT declarations each time?... In the event of a no-deal scenario, we assume that WTO tariffs would apply and this would have negative consequences for our economy”. The truth may be uncomfortable for unionist politicians who try to play down the significance of north-south trade – but also for nationalists and republicans who emphasise the value of cross-border trade. The reality is that both are vital. Playing one trading relationship against the other is tribal and unhelpful. The challenge is how to manage Brexit in ways that damage neither east-west nor north-south trade. Achieving this has become much more difficult following Salzburg.